Someone remarked the other day “When I am reading, I tend to fidget with things – my fingernails, the edge of a page, my hair, anything I can get my hands on. It’s a nervous habit borne out of restlessness.” This person is quite young. She can listen to music, solve mathematics problems and absorb information from a screen apparently all at the same time. She belongs to a new generation of instant-gratification technology, a spinoff from which is a tendency to lay blame for some small shortcoming or other outside of oneself. As I write this, it’s a certainty that I shall be interrupted. I shall have to stop what I am doing, reconfigure the prefrontal cortex and start again later. But, having stopped doing this, I cannot get back to exactly where I was before. I have to re-read what I‘ve written, marshal a train of thought, establish whether this fresh configuration matches the last one or not, then a few more sentences tumble untidily on to the page. If I don’t and the finished product doesn’t match my expectations, I blame the interruption, not me. When I ‘work’ if one dignifies this kind of thing with such important a word, I need silence. If someone is listening to music in the same room– I can’t concentrate. If visitors come, their loud enthusiasms fracture my thoughts and derail the train where my consciousness is leading me. Thoughts unravel and I can’t quite concentrate on what I want to say next. An interruption now beckons. I have to put this down and deal with it. The interruption, ironically, concerns our Internet router. The phone line drops out for no apparent reason. The ADSL stops, then starts again. It can’t multitask, in other words. 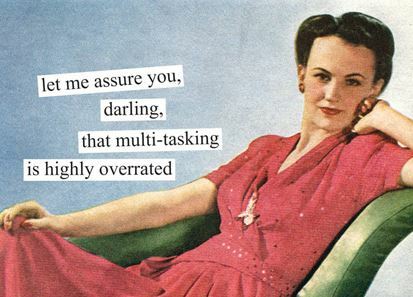 Many people boast about being able to multitask, especially women. I watch Gipsy as she cooks, chops, answers the phone and watches TV, apparently simultaneously and marvel at her multitasking ability. But, is she really doing several things at once? I wonder sometimes. The research is almost unanimous, quite a rarity in social science, and asserts that chronic multitaskers show an enormous range of deficits. They’re really not very good at all kinds of cognitive tasks since the very act of multitasking interferes with the ability to focus on one thing at a time.They are not fully present in conversations. If that irritating little bleep informs me that I have an instant message on my phone, the urge to check and see whether something earth-shattering has happened is almost overwhelming. If I stop, look, respond, I’m then tempted to check my social media feeds. In other words, I am practising distraction, which is stressful and unhealthy, so, I’ve just stopped doing it, silencing the cacophony of voices demanding my attention, now. I have taken to turning the sound off. Nothing is important enough that it can’t wait for me to finish up what I’m doing before dealing with it. ‘What? Your mother just got run over by a bus!’ So what. Will it change either prognosis or future events if I haven’t found out for a few minutes? Absolutely not. Am I an uncaring, mindless brute because I have abandoned my mother for a few minutes? No, I’m not, and I don’t need to feel guilty about it. Of course, persistent procrastination isn’t the issue. Were I to do nothing for a week, all of the above could be legitimately targeted at me.